So, what in the world do Pineapples have to do with Diablo III? Well, quite a bit more than you think. Here is some information I’m sure you haven’t heard before (a must know for any great trivia players, or just being “that guy” who always seems to know everything). When Blizzard launched Diablo III, the game stopped short of coming to China, as China requires all imported games to be cleared by the government’s Ministry of Culture before they can be sold. However, this review can take months (as was the case with one of Blizzard’s previous titles, Starcraft 2, which received approval by the ministry a whopping six months after its initial launch). Sellers needed a plan, and fast. Site moderators tasked with enforcing the rules began searching on The Chinese e-commerce site, Taobao Marketplace, for the banned Diablo III game. They searched with the full Chinese name of Diablo III — which translates as “God of Dark Destruction” — and it turned up with no results. But vendors were selling CD keys to the Taiwanese version of the game, calling their product “Big Pineapple III”, which in Chinese is pronounced as ‘Da-Bo-Luo’ (which sounds like the game’s English name). To even further avoid censors, the vendors uploaded pictures of pineapples to advertise their product. Victory to all Chinese gamers! Unfortunately, after someone decided to spill the beans about how easily and cleverly sellers were getting it over on the Chinese government, the scandal was put to an end. And, alas, it seems Diablo III still isn’t available in China! So, what do we do when we learn something new? We make cake! These are delicious cakes, sure to come with a story that few have heard before. I prefer to make these cakes in a particular Mini-Pineapple Cake Pan, but you could use a large muffin tin if you don’t have one (but I would highly suggest buying the special pan!). Make topping: First melt the butter in skillet. Add brown sugar and continue to heat, stirring, until mixture is pourable. You must stir frequently or the sugar will burn. Plop some butter and brown sugar mixture in each pan cavity, just so the bottom of the cavity is coated (about 1tbsp). Remember, the leaves on this pan are thin, and you may accidentally (or purposefully) make the leaves entirely sugar. While this is delicious and decorative, it can be very hard to release these from the pan. Place one pineapple ring on top of the sugar mixture. Make batter: Beat butter in a large bowl with an electric mixer until light and fluffy, and then gradually beat in granulated sugar. Add eggs and vanilla. Add the flour and baking powder together, and then add half of the flour mixture and beat on low speed just until blended. Beat in pineapple juice, and then add the remaining flour mixture, beating just until blended (If the batter appears slightly curdled, that is okay. It is because of the pineapple juice; it’s normal for this to happen. Also, it’s normal it does not to happen. Basically, stop worrying). Spoon your batter over the pineapple topping you have already placed in the cavities, making sure that you do not fill each one entirely (remember, the cake expands in the oven). I like to fill them about 3/4 full, which makes them overflow a little. This allows me to cut off the top with a knife, leaving a nice flat bottom for the cakes. Bake in middle until a toothpick tester comes out clean, around 15 to 20ish minutes (I really don’t time things unless for some reason it is super important, and this is not the case here). Let the cakes cool in pan before removing (but you do not need to wait until cakes are entirely cool. Generally if the pan is okay to touch with bare hands, you can release the cakes). 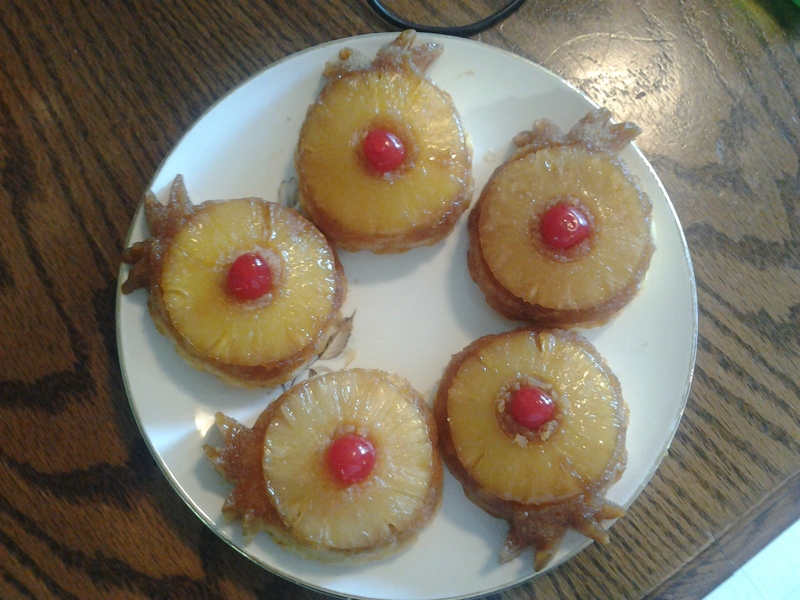 Place each Mini Pineapple Upside Down Cake on a plate and garnish with a maraschino cherry in the center. I like to use a teaspoon to hollow out a small space for a whole cherry in the center of the cake. Serve cake just warm, at room temperature, or chilled! Personal preference really rules here. I rather like them chilled or warm!